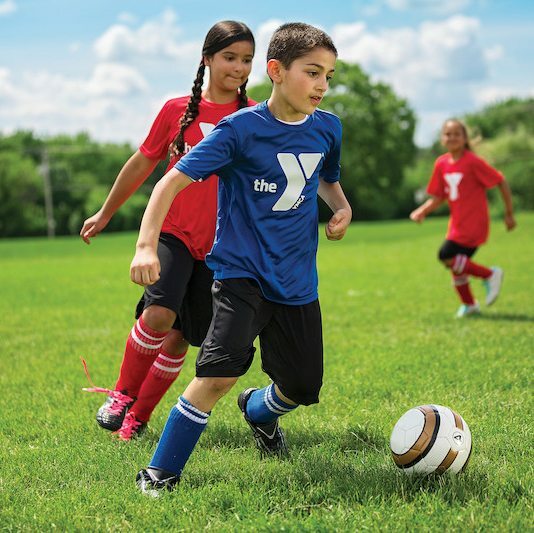 The YMCA offers Youth Soccer leagues in Spring and Fall. We promise no try outs, no getting cut and no bench warmers! Every child plays while making friends and learning new techniques, open to boys and girls. Our Youth Soccer Program helps kids become not only better soccer players, but better people as well. It’s a progressive program, with multiple age-specific levels. Every child gets to play and the games are safe, exciting and fun. We encourage fair play, positive competition and family involvement. Girls and boys have separate leagues. Practices are once a week at locations chosen by volunteer coaches. Games are played on Saturday mornings at various sites. All participants are divided by grade. We’ll introduce your children to the basic fundamentals and rules of soccer as well as improve social interaction with peers. Volunteer coaches will hold practices/games at your chosen location. It’s a great way to learn, have fun and get introduced to kids’ soccer.